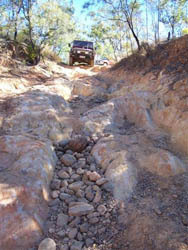 This track was originally used by Cobb & Co coaches in the late 1800\'s to the centre of the Palmer River Goldfields, Maytown. The track up and over hills is not steep as horses had to pull the coaches up the hills and through the mountains however, the track has not been maintained for over 150 years. Consequently it has been rated accordingly and also because of the many washouts. Most of the track needs to be driven to low range to be safe and after the dozen times I have done it, no damage to any vehicles. If one travels with the motto "Low & slow" - all will be okay. It is recommended that you do not attempt this track as a single vehicle because UHF radios and mobile phones do not have coverage, should you encounter a problem. It is also highly recommended that the track not be attempted during the local "Wet season", being December to March. Also in the wet you will encouter many gully and creek crossings where the water is channelled into narrow creeks and the water roars through, too fast to cross at any depth. If it rains while you are in this area, then the gullies, creeks and rivers will rise behind you which could isolate you for weeks. After the gullies and creeks, you also have to cross the Laura, Little laura, North Palmer and Palmer Rivers. Please contact me should you require any further information.